Indonesia’s Minister of Public Works and Housing Basuki Hadimoeljono has said that a new frontier of cooperation in infrastructure and connectivity with Sri Lanka has emerged following Indonesian President Joko Widodo’s official State visit to Sri Lanka last month. Speaking at the commemoration of the 70th anniversary of Independence and 65 years of diplomatic relations between Indonesia and Sri Lanka last week, Minister Hadimoeljono – a senior Minister in the Indonesian Cabinet - observed that the bilateral engagement has been marked by high level interactions which have elevated the relationship significantly. He outlined the longstanding connections between the two countries dating back to the 5th century through to the post-independence connections. Representing the Republic of Indonesia at the event, Hadimoeljono extended Indonesia’s heartfelt congratulations to Sri Lanka on the momentous occasion. Expressing the hope for deeper and stronger bilateral relations and cooperation, he emphasised that the outcomes of the recent high level visits, including the several memoranda of understanding signed between the two countries, as well as the instruments being considered for intensified economic engagement, would provide a strong basis for intensified engagement. The Ambassador of Sri Lanka to Indonesia and ASEAN Dharshana M. Perera hosted the commemorative event at Hotel Borobudur in Jakarta which was also graced by Jakarta’s Deputy Governor Sandiaga Uno, Senior Officials of the Government of Indonesia, representatives of the Diplomatic Corps, business community, academics, artists and representatives of the Sri Lankan business community. In his remarks, Ambassador Perera outlined the strides Sri Lanka has made in the last seven decades including human development, diversification of the economy, strengthening of political freedoms and democracy, etc. While outlining the strong historical connection dating back to the Sri Wijaya period, he pointed to similarities in culture, shared values of democracy and pluralism which characterise the two countries. He delved on the contemporary bilateral engagement and multilateral partnership which has progressed in several fields including political, economic, cultural, social, security and maritime-related fields and spoke of Sri Lanka’s desire for intensified interactions with ASEAN. Sharing his perspective for the future trajectory of the bilateral engagement and with the region, Ambassador Perera opined, “The very ocean which used to distance us in the past, now, in modern times, brings us together and presents us with immense potential for vibrant, robust engagement,” adding that “with the elevation of our engagement in all fields and our shared values and vision of the future, the relations between Indonesia and Sri Lanka has the real potential of blossoming into one of notable excellence”. 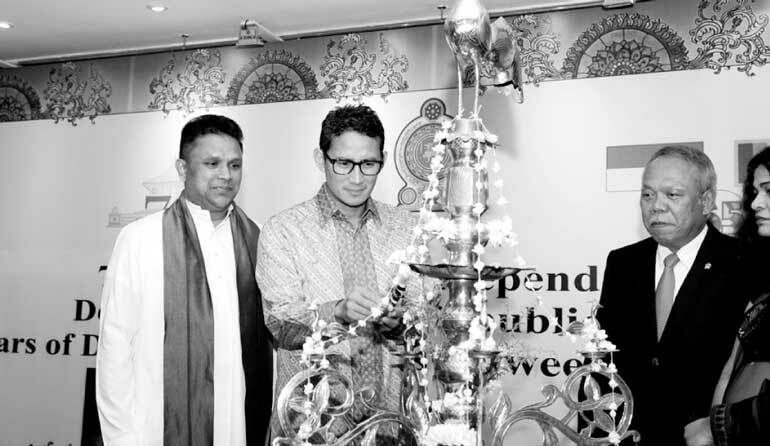 The national event with the Sri Lankan community and the morning Reception marking the 70th anniversary of Independence was held on 4 February 2018 at the Embassy at Jalan Diponegoro in Jakarta, reflecting the multi-religious multi-cultural character of Sri Lanka.